We're huge fans of open source here at Linux Journal, which I'm sure comes as no surprise to anyone. The best part about Linux itself, however, is that it's the concept of open source realized. It has permeated every aspect of IT, and it has proven that being open doesn't equate to being insecure. In fact, it's quite the opposite. When you have nothing to hide, there aren't any dirty secrets waiting to be leaked. In the spirit of "doing things", this month we've got a bunch of really cool topics that show open source in action. We start with Reuven M. Lerner. Last month he talked about navigating data, and this month he talks about Pandas. Specifically, Reuven talks about parsing and analyzing CSV (comma-separated values) files with Python. If you're a data nerd and want to get the most from your CSV data files, you won't want to miss Reuven's column this issue. Dave Taylor follows with a look at some powerful scripting commands borrowed from the C library. If you want to tighten your code, the printf command is incredibly powerful and thankfully available for scripting. 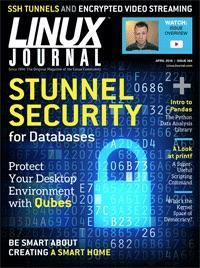 Kyle Rankin keeps his security head firmly in place and starts a series on Qubes this month. Qubes is a distribution focused on security. With all the publicity encryption and privacy is getting thanks to the Apple/FBI case, it's important to understand how security on your devices functions. Kyle starts his series by describing how Qubes compartmentalizes applications, isolating them from each other and the OS itself. Whether or not you want to beef up your desktop security, his article is a fascinating look at an awesome technology. I go in a very different direction this month, and rather than talk about security, I focus on what sometimes can be the opposite of security—convenience. I've always wanted a smart house, and thanks to SmartThings and the Amazon Echo, I finally have one—or at least the start of one. If you've ever wanted to talk to your house like it was the computer on the Starship Enterprise, you'll want to check out my column. SSH is arguably my favorite command-line tool in Linux. It's secure, and it's so versatile. Ramon Crichlow explains how to stream video securely through an SSH tunnel this month. Not only will you learn how to accomplish a cool video streaming task, but along the way, you'll learn a lot about how SSH works and what tunneling really means. You'll also learn how to tweak it so it's not more frustrating than useful! Charles Fisher follows Ramon with a very in-depth look at using stunnel as a tool for authentication, isolation and privacy of data stored in an Oracle database. If you've ever managed an Oracle database and had concerns about its security implementations (even considering recent improvements), using the open-source stunnel tool can add a solid layer of security that is regularly updated and offers the peace of mind that comes with FOSS. Whether you want to improve the security of your desktop environment, use Linux as a tool to accomplish a necessary function, or just turn on your bedroom lights by talking to a Pringles-can-shaped robot, this month is an issue worth reading. As always, it's also full of product announcements, time-saving tips and other Linux-related goodies. Whether this is your first issue of Linux Journal or you've been one of us for years, we hope you enjoy this issue as much as we enjoyed putting it together.